Departamento de Ingeniería Informática, Universidad de Santiago de Chile, Av. Ecuador 3659, Santiago, Chile. The aim of geometric calibration of a X-ray testing system is on the one hand at the approximation of the parameters of the imaging system and on the other hand the approximation of the parameters of the function required for the determination of the exact position in 3D-space of the object under test. Knowing these parameters it is possible to determine the transformation of a 3D-point of the considered object to a 2D-pixel of the X-ray image. Multiple views of the object allow us to realize an inverse transformation (2D Ž 3D). This paper presents a method for the calibration of a X-ray test rig, mapping the X-ray images through an image intensifier with curvature in a non-linear way. In case of a flat detector as image receiver, the calibration can be performed omitting the no linearity of the model. The model obtained by the calibration is used to measure exactly 3D features of an object under test. Thus, we can find the correspondence in stereoscopic images and the localisation of a point in 3D-space. The mentioned calibration method takes place offline using a calibration object which is X-rayed in different positions. For each radioscopic image of the object the coordinates of the measured calibration points within the image are recorded as well as the position of the object within the test rig which is given by the manipulator. The procedure for geometric calibration of the X-ray test rig solves a non-linear optimisation problem, minimising the distance between each calibration point and its corresponding (modelled) projection in the X-ray image. A representation of the geometric model of the X-ray test rig is given in this article. Further on the objective function of the calibration problem is defined, a solution for this problem is described and finally a real X-ray test rig is calibrated. The paper is organised in the following sections: Section 2 defines the objective function of the calibration problem. A solution for the problem is explained in Section 3, followed by an exemplary calibration of a real X-ray test rig in Section 4. Finally, the results are presented. Using homogenous coordinates it is possible to describe the perspective projection of a 3D-point onto a plane linearly [Fau93, Hey95]. The homogenous coordinates of a 2D-point are denoted as x = [x y 1]T , respectively the coordinates of a 3D-point as X = [X Y Z 1]T.
Note that using a flat detector there is no geometric distortion of the X-ray image and therefore no non-linear transformation has to be done, this means. where q is the rotation angle between x,y - and u,v -axis, kx, ky denote the scaling factors in direction of x,y and u0,v0 describe the translation of the origin of the u,v-coordinate system. with parameter vector X. Its elements are the parameters of the CCD-camera, the image intensifier and the manipulator. Note that the estimated projection is a function of X. As defined in Section 2 the calibration is an optimisation problem. The parameter vector X has to be determined in a way that minimises the objective function Q in equation (5). After applying this method, the measured coordinates of the calibration points in the images correspond at best to the calculated coordinates estimated from the geometric model. Linear methods for camera calibration can be found in [Fau93, Hey95, Kle96, Xu96]. Taking into account the distortion of the projection, caused for example by lens distortion or an curved image intensifier, the non-linear methods proposed in [Bra96, Wen92, Jae90] can be used. These methods are only valid for the calibration of image receiver (image intensifier and CCD-camera), since they consider only a single position of the object. In this case the projection of the three dimensional world of the object to the two dimensional projection plane is a constant function, because only one projection matrix has to be estimated. However, due to the different positions of the object during the X-ray examination the projection matrix is not constant. It is a function of the objects position and its perspective projection. The projection matrices can be calculated from the position data, available from the manipulator. Therefore, the manipulator has to be taken into account for the calibration. Fig 1: Calibration of a X-ray test rig. m calibration points within the calibration object have to be measured. This leads to the 3D-coordinates Mj = [Xj Yj Zj 1]T for j =1,..., m.
The calibration object is X-rayed in n different positions. For each image the actual position given by the manipulator has to be recorded. The m calibration points within the n images amounts to the coordinates within the X-ray image uij for i = 1,..., n and j = 1,..., m are measured. Even if not all calibration points are visible in the image the calibration problem can be solved if index j in (5) is only taken into account for calibration points that are visible in the i -th image. Initial values for the parameters of the CCD-camera, the image intensifier and the manipulator have to be chosen. These initial values can be estimated by the measurement of the test rig respectively by the knowledge of technical data belonging to the plant and the camera. The values tXi,tYi,tZi and wXi,wYi,wZi are estimated from the position data given by the manipulator. They indicate the position and rotation of the object within the i-th image. In [Mer00] such a model is used to realize the geometric calibration for the X-ray test rig MU 231 developed by Philips Industrial X-Ray GmbH. The scan axis X-ray sourceimage intensifier was fixed. In this case the object was only rotated around the Z-axis. This means that the translation vector was constant and so the rotation matrix depends only on the rotation angle wZ. Calculate matrix A from equation (2). The objective function Q in (5) corresponds to . The parameter vector X includes the parameters of the camera (kx,ky,q,u0,v0) the parameters of the hyperbolic model of the image intensifier (a,b) and the parameters of the manipulator which gives the position of the object. with DX(t) as the increment in iteration step t.
Otherwise the procedure has to be repeated from step 5. Fig 2: X-ray test rig MU2000. In this Section the geometric calibration of the X-ray test rig MU2000 developed by YXLON International X-Ray GmbH will be described. The MU2000 manipulation is done by the manipulator bench and the vertical scan-axis to which the image intensifier and the X-ray tube are fixed [YXL98]. A schematic representation of this X-ray test rig is shown in Figure 2. The manipulator has six degrees of freedom: rotation of the R-axis of the manipulator table, rotation of the scan-axis T, translation of the manipulator table in X- and Z-direction, adjustment of the height Y of the scan-axis and adjustment of the focus-detector-distance F. These quantities are given from the manipulator as increments. Fig 3: Calibration object: Photo and CAD-model. The calibration object used in our experiments is shown in Figure 3. It is an aluminium object with an external diameter of 70 mm. A CAD-model was developed by measurement of the calibration object. It has seventy small holes (f = 3 ~ 5 mm) distributed on 4 rings and the centre. The centres of gravity of the holes are arranged in 3 levels. Fig 4: Search for calibration points: X-ray image, edge detection and assignement of regions. Fig 5: Eight X-ray images of the calibration object. The search for the calibration points within the X-ray image is done with the procedure for the segmentation of potential casting faults described in [Mer99]. This procedure makes a search for closed regions with high contrast and defined size for the area. The centres of gravity of the detected areas are defined to be the calibration points. The assignment of the segmented regions to the corresponding calibration points can be performed automatically if a projection model is available. Then the domain will be assigned to the calibration point with minimal distance to its centre of gravity. Only complete enclosed regions will be segmented. Figure 4 shows exemplary the search for the calibration points within a X-ray image. Figure 5 shows a sequence of the calibration object realized by rotation of the R-axis (see Figure 2). Fig 6: Geometric representation of the X-ray test rig. The 4 x 4 matrix Si represents the rotation and translation of the object referred to the X-ray source. Si is defined by the position of each axis of the manipulator. To solve the calibration problem as described in the last Section the new projection matrix Pi has to be replaced in (6). Fig 7: Results of the calibration. The calibration object was X-rayed in sixteen different positions. For each position the coordinates of the manipulator were registered in increments. 532 holes were segmented. The X-ray test rig was completely measured to get initial values for the parameter vector. The described model was implemented and the proposed method for solving the calibration problem was investigated. As result for the calibration Figure 7 shows eight X-ray images together with their projected 3D-model. The correspondence of the measured calibration points with the estimated points of the 3D-model is excellent. For example, we can see the second X-ray image of Figure 7. Since no hole is visible, this image was not used for the calibration. Nevertheless, the projection of the model coincides very good with the X-ray image of the object. The mean value of the estimated error (distance between measured and estimated calibration points) was 1.83 pixel with a standard deviation of 2.19 pixel. Bra96 Brack, Ch. ; Götte, H.; Gossé;, F.; Moctezuma, J.; Roth, M.; Schweikard, A.: "Towards Accurate X-Ray-Camera Calibration in Computer-Assisted Robotic Surgery", Proc. Int. Symp. Computer Assisted Radiolog(CAR), Paris, 721-728, 1996. Fau93 Faugeras, O.: "Three-Dimensional Computer Vision: A Geometric Viewpoint", The MIT Press, Cambridge MA, London. 1993. Hey95 Heyden, A.: "Geometry and Algebra of Multiple Projective Transformations", Doctoral Dissertation, Departament of Mathematics Lund Institute of Technology, Sweden, 1995. Jae90 Jaeger, Th. 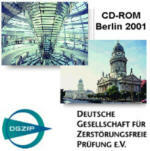 : "Entwicklung von Verfahren zur geometrischen Entzerrung radiographischer Aufnahmen", Diplomarbeit am Institut für Meß- und Automatisierungstechnik, Technische Universität Berlin, 1990. Kle96 Klette, R.; Koschan, A.; K. Schlüns: "Computer Vision: Räumliche Information aus digitalen Bildern", Vieweg, Braunschweig, Wiesbaden, 1996. Mer99 Mery, D.; Filbert, D.; Krüger, R.; Bavendiek, K.: "Automatische Gußfehlererkennung aus monokularen Bildsequenzen", Jahrestagung der DGZfP, (1):93-102, May 10 - 12, 1999, Celle, Germany. Mer00 Mery, D.; Filbert, D.: "Die Epipolargeometrie in der Röntgendurchleuchtungsprüfung: Grundlagen und Anwendung", at - Automatisierungstechnik, Oldenbourg Verlag, 68(12):588-596, 2000. Mer01 Mery, D: "Automatische Gußfehlererkennung aus digitalen Röntgenbildsequenzen", Dr. Köster Verlag, Berlin, 2001. Sch93 Schaback, R.; Werner, H.: "Numerische Mathematik", 4. Auflage, Springer Verlag, Berlin, Heidelberg, 1993. Wen92 Weng, J.; Cohen, P.; Herniou, M.: "Camera Calibration with Distorsion Models and Accuracy Evaluation", IEEE Trans. Pattern Analysis and Machine Intelligence 4(10):965-980, 1992. Xu96 Xu, G.; Zhang, Z.: "Epipolar Geometry in Stereo, Motion and Object Recognition: A Unified Approach", Kluwer Academic Publishers, Dordrecht, Boston, London, 1996. YXL98 YXLON: "Technische Daten des 160kV Röntgenprüfsystems MU2000", YXLON International X-Ray GmbH, 1998.